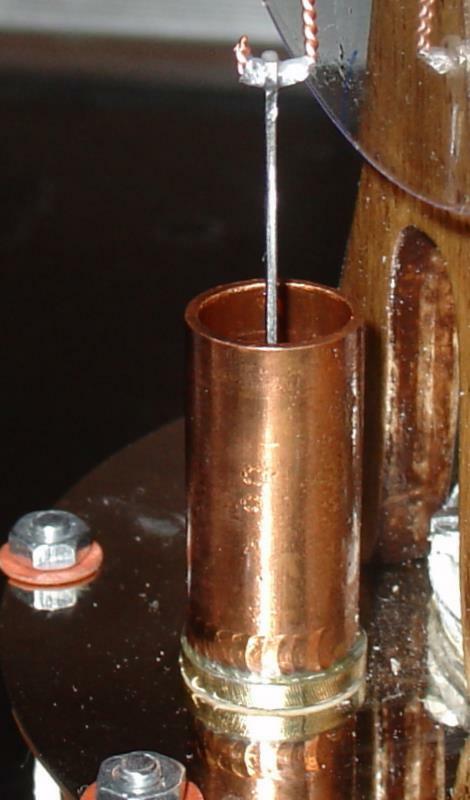 Actually the Stirling Engine was my first on the list of priorities, but steam engine turned out to be easier to build, despite of more machining required. This engine is not particularly original but, following the tradition, it is mostly built out of computer and household junk. Of machines, only a micro drill press was used for drilling and milling. Milling is not really required in this construction, but having a rotary head or table really helps when making radial holes in things. 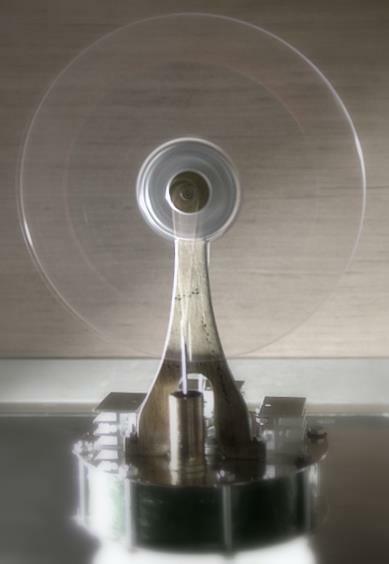 The design of this engine, which would be called low-temperature differential, gamma-type Stirling cycle engine, is pretty common and there are lots of engines like this on the web, both industrial and homemade. Most of them either rely on some elastic material instead of power piston, or require you to have a lathe to make a well-fit piston. I don't really like constructions with moving rubber pieces and I can't afford having a lathe too. So I had to find a simple solution. I started with gathering together what I had lying around to see if I can get any reasonable action out of the parts that I can put together. 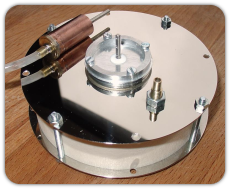 I had plenty of aluminum HDD platters, some platter spacers, aluminum bottles, CD-ROM drive shafts (the optical heads travel along them). At first, I thought that a plywood displacer will do and I made this awful piece. It worked for tests but was proven to be too heavy and clumsy for the real engine. For the main chamber walls, I used a roll of paper tape that is normally used for paint jobs. Finding one is much easier than finding a decent piece of clear acrylic tubing. Then I built the power cylinder and its mount. I had different thoughts about how the whole thing will be put together and at first I was planning to use a piece of tubing to connect the power cylinder to the main chamber. Later I discarded the idea but the picture remained. It was a convenient setup for first tests though. 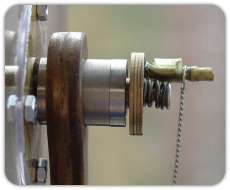 The power piston is a piece of 12mm OD copper tube, a brass disc soldered to one end. 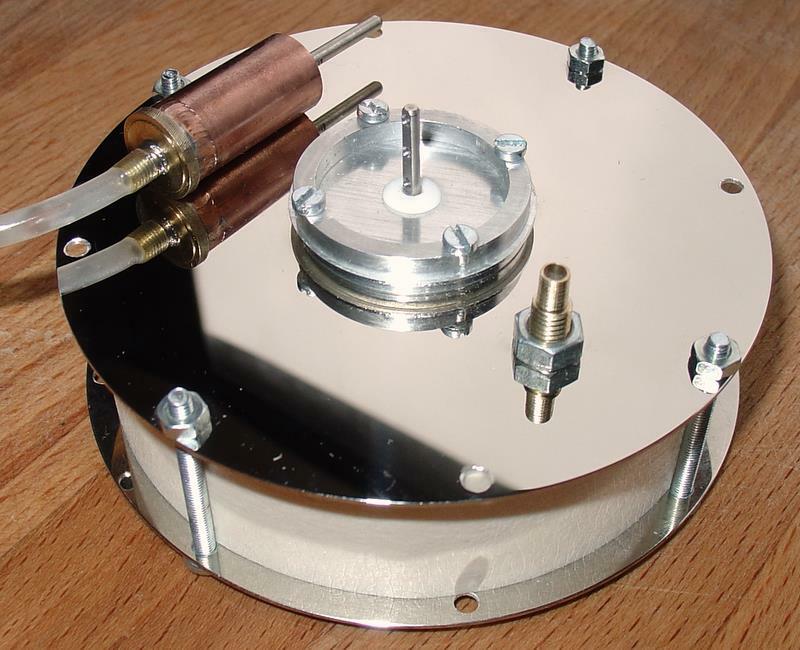 Before soldering the disc to the cylinder, a hole was drilled into it, tapped, and a piece of drilled out M5 rod was soldered to the disc. A crucial thing in this engine is the displacer gland. Most guides I could find on the net are too easy on this --- like, just make an airtight gland --- easier said than done. I tried several things but ended up with trusted piece of M5 brass rod drilled precisely for the chosen shaft to fit. The friction is minimal and it's almost airtight. It is important to taper the drill pretty wide so that it will keep some amount of oil. The gland is fixed by two nuts. 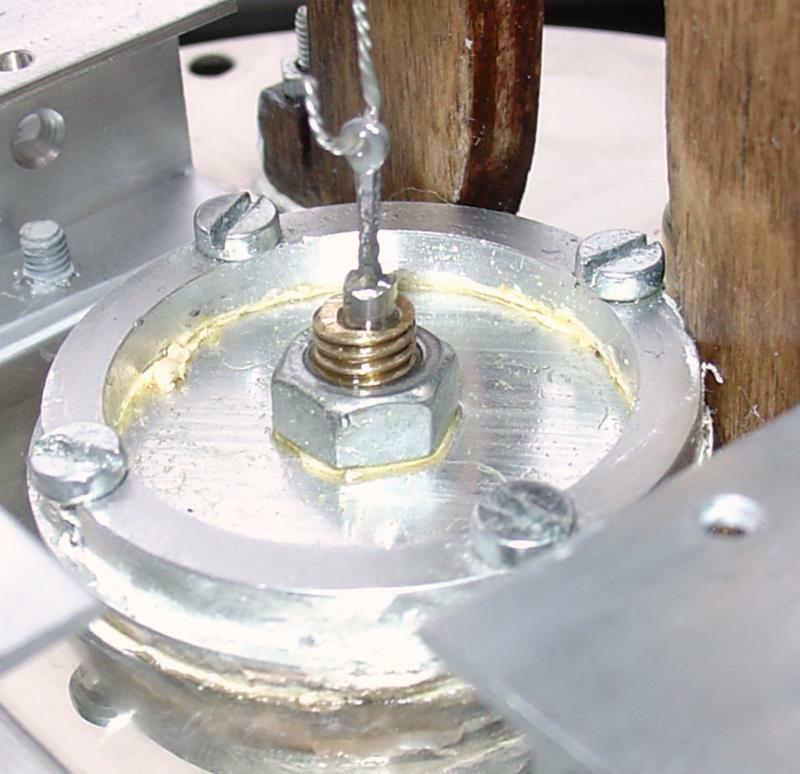 The bottom nut would obstruct displacer movement, so there is a a riser made out of HDD platter spacers. It's all clear on the picture. Sorry for yellowish cast on the sealant, that's what you get after oil hits the machine. The piston.. It's not even pictured here, although it's visible on the video. It's not a particular piece of beauty. I made my piston by pressing a kind of thick epoxy cement into the same copper pipe. I don't know the proper name for this stuff, mine was called `QuickSteel'. 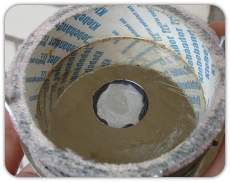 The epoxy mass will take the shape of the tube, which is just what is needed. Some grease should be applied to the pipe beforehand, and the slug has to be removed before it's has hardened completely. Of course the shaft must be somehow pressed into it. This kind of epoxy is easy to drill, so it's very possible to make a hole for the shaft later. A piston like this must not be very tight in the cylinder because the cement has relatively high friction coefficient. To provide airtight movement of the piston, motor oil is used. I do not give any dimensions here. I did not use drawings for this project, making them now makes little sense too because everybody has his own junk. Besides, you would have to experiment a lot with lengths of shafts, crank pins and so on. One particularly interesting finding that I discovered during "debugging" process: it is important to let the piston lightly touch the bottom of the power cylinder without hitting it. If you position it too high, the oil will slowly sink into the main chamber and stay there, which is not useful. But when piston just almost touches the bottom of the cylinder, it will pick the oil that's gathered there. The bottom of the cylinder will thus serve as crankcase or lubricator. But if you make the shaft or linkage too long, the piston will hit the bottom and the engine will have difficulty rotating or get stuck at all. The bottom heat transfer plate is sealed by a small round piece of aluminum, it is simply glued with the help of same epoxy cement as the one used for casting the piston. First tests have proven that paper bobbin doesn't make a nice seal, so I cut out thin o-rings out of some sort of packing foam. Together with sealant (silicone or something) they make perfect seal. After some more tweaking, adding sealant to the spacers in the center and some other things, the chamber was airtight. 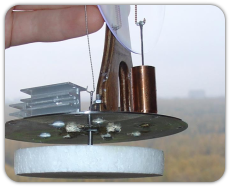 I could gently heat the bottom plate, move the displacer up and observe the power piston getting thrown out of the cylinder. 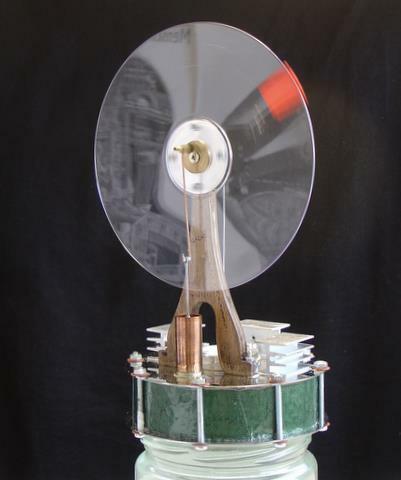 Not particularly interesting is the flywheel standard, which was painfully cut from a piece of 7mm plywood. First with circular saw, then with a jigsaw, then with a sandpaper cylinder on a dremel-like tool. The hole at the top must accept HDD heads bearing assembly so that it just fits, with some force. After it's done, crankdiscs can be installed. My crank pins are set so that both the power piston and displacer travel about 10mm... Travel length must be chosen realistically, the displacer moves approximately half the height of the main chamber and power piston should be moving somewhere about that too. The discs have crankpins soldered into holes made for them. The shaft in the bearings has M2.5 threading. After first crankdisc is bolted, it is very hard to properly fix the other one. 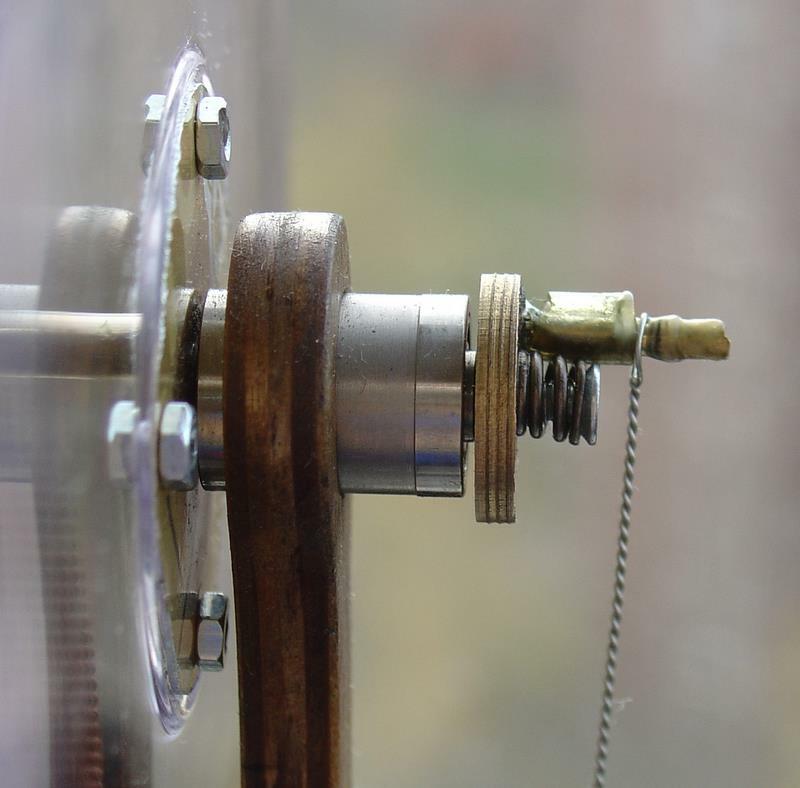 Hence the spring that allows tight rotation of the disc after screws are tightened. 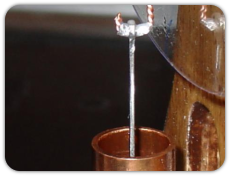 The difference between power and displacer pins must be 90 degrees. There are many other, probably simplier alternatives to crankdiscs. The links are made from pieces of wire. Something like what you can find in a CAT5 or SATA cable. 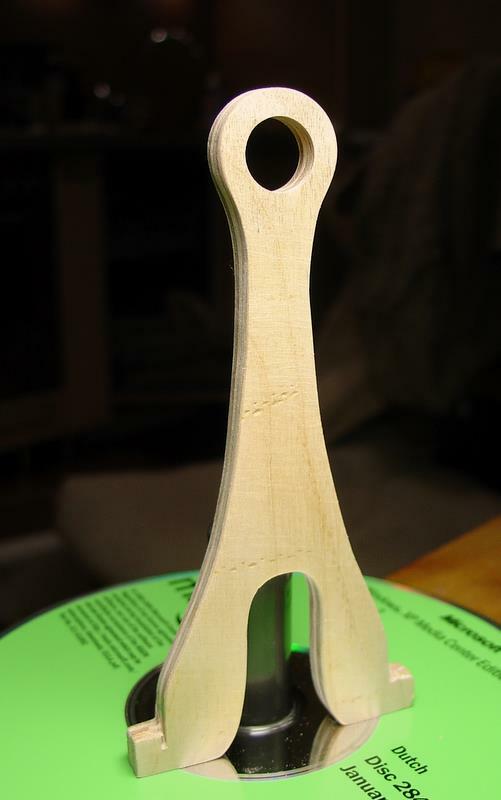 Just twist them two-fold on a drill and they will be sturdy enough for a lightweight construction like this. The length has to be chosen experimentally. Twists in wire have plenty of friction so I added a sleeve bearing to the power shaft link. To the left, this is the complete assembly without the main chamber (which is unfortunately not transparent). Among everything that's been described earlier, it shows the displacer and how the power cylinder is mounted. The displacer is made out of regular white granular packing foam. 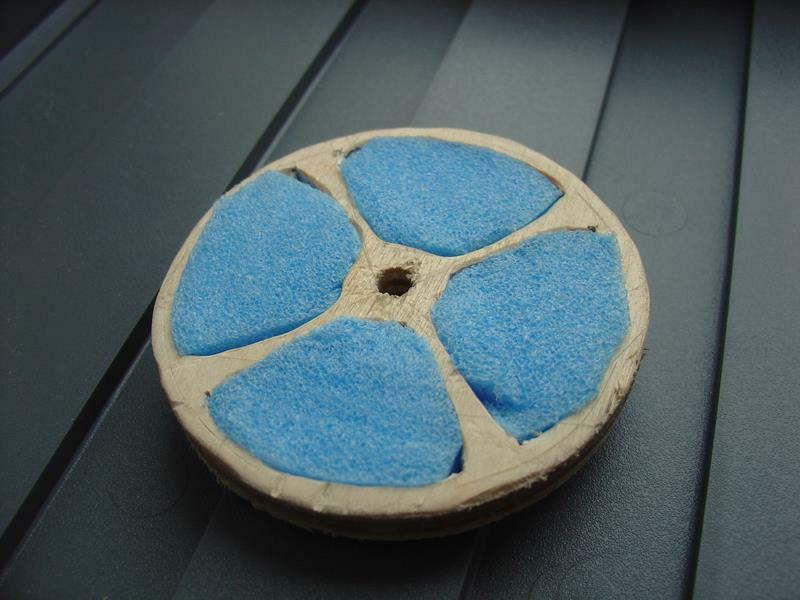 It can be carefully cut with sharp thin blade, then sanded with some 100-200 grit paper. The shaft is fixed with the help of some furniture-related pieces which I don't know how to call. And for the power piston there's a hole drilled, which is then tapped for M5 (yes, it's not the most reliable way given that the platter is only about 1mm thick, but it works). There's sealant everywhere. The screws holding heatsinks can be seen too. Heatsinks are not really required, they just look cool and provide better heat transfer at the top. That about sums it up. There were many many tweaks. First the gland, I tried a plastic one but it had a lot of friction and wasn't airtight enough. Then the displacer, it really should be light. On the pictures you can see that I thinned all shafts to minimum, this really helps. For once, it's better to have a larger opening between chamber walls and displacer than have it touch them, even very lightly.. 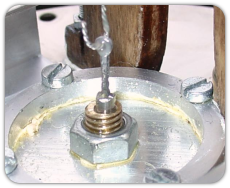 It is very important to have plastic washers separating the screws that hold top and bottom together from the plates, otherwise the heat bypasses the engine through the screws. I think I can't really remember everything.. It was a very interesting project with a satisfying result. The red thing counterbalances the weight of pistons, somewhat. After all tweakings, the thing runs approximately 30 minutes (I once got 40!) on a little 200ml glass jar of freshly boiled water. The first ever assembly would barely turn at temperatures high above water boiling point, at which plastic is melting already. I went a long way between first attempt and final result. The speed of this engine is not shocking, it tops at about 100RPM, maybe slightly more, then slows down and halts when it's nearing some 20-30 rpm. I can't adequately measure minimal temperature difference, but I can safely dip my fingers into the water that's left in a jar after the engine has stopped. I couldn't make it run on ice alone though. 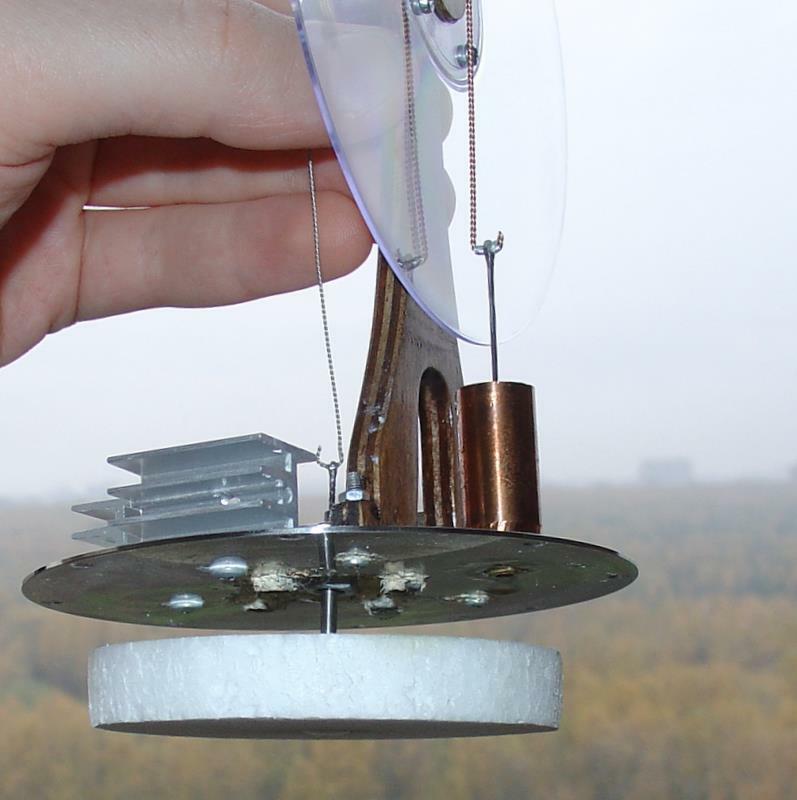 Enjoy my Stirling engine video. Music by Alexander Mosolov.